If you were busy Monday night and missed our regular "Let's Play Co-Op" stream, fear not! We've got a handy recap of it right here. This week, dipped into Cellar Door Games' Full Metal Furies, and found some great co-opportunities even if network issues did foil us a bit. Cellar Doors has put a lot of thought into the systems of this game to make it stand out from the typical brawler. The most helpful of these are the indicators that show up around enemies that let you know which player they're targeting. Those same indicators will pulse when an enemy is about to attack, which is extremely useful amidst all of the on-screen chaos. I also really like the fact that the screen acts as a boundary, preventing enemies from going past it when you knock them up in the air. When you combine that with being able to hit enemies in the air for bonus damage, there are some interesting things you can do with some co-op buddies. That being said, it's clear the team is still working out a few bugs and other issues. While we were playing, one of us got dropped on a fairly regular basis until we shifted from a trio to a duo. This is apparently a known issue that the developers are working to address and fix, and thus far is the only big mar on an otherwise great co-op title. We'll have a full Co-Op Review for the game next week, so be sure to check back in to get our full thoughts on everything the title has to offer. 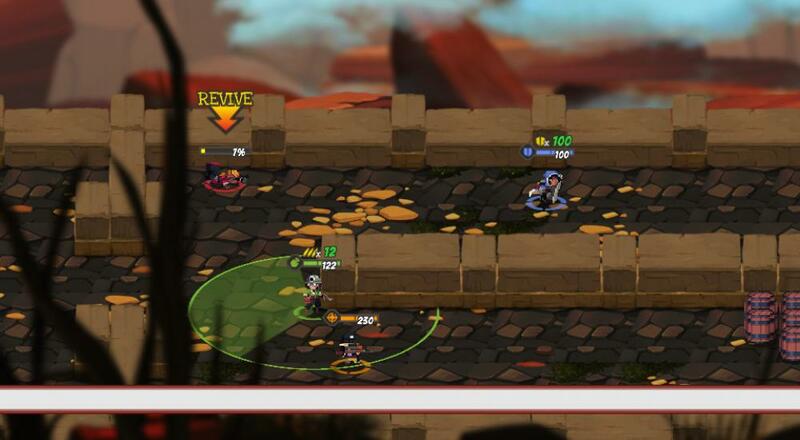 Full Metal Furies is available on PC via Steam and the Xbox One. It supports four player co-op online, four player couch co-op, and four player combo co-op (i.e., a mix of online and couch). Page created in 0.9654 seconds.